Brooklyn is a very nice movie. It’s an arthouse picture for people who don’t frequent arthouses—a tale of cultural displacement so sanitized and swooningly romantic that film buffs could recommend it to their parents and grandparents without hesitation. All of that may sound like a slam, but it’s not meant to be. 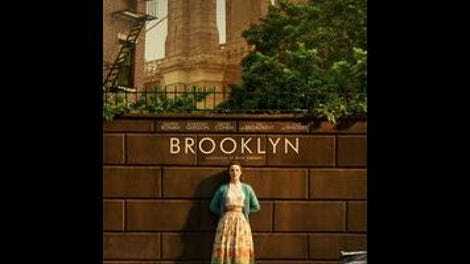 It’s not easy to make a movie as beautiful as Brooklyn, where the stakes are low but the outcome really matters. This is an old-fashioned entertainment, but one so masterfully crafted and heartfelt that it’s hard not to love. Saoirse Ronan gives a career-defining performance as Eilis Lacey, a meek shopgirl who’s overlooked in the small Irish village where she was raised, and then overwhelmed after she moves to New York, in the mid-1950s. Back home, Eilis’ sister Rose (Fiona Glascott) is the popular one, on track to marry one of the town’s rich kids. Initially, Eilis doesn’t find life any better in America, where she’s stuck in a women’s boarding house with ladies who find her too square, and struggling in a department store that expects its clerks to be more outgoing. But then Eilis gets a fella—a sweet-natured Italian-American named Tony (Emory Cohen)—and as he hastens her toward a future of domesticity and motherhood, she starts to get a fuller understanding of her own mind, and what she actually wants for herself. Even more options present themselves when she returns to Ireland for a visit, where she discovers she’s more in-demand than she’d ever imagined, and she wins the attention of desirable local bachelor Jim (Domhnall Gleeson). Both of the paths that are open to her promise security, romance, and as much of a guarantee of happiness as anyone ever gets in this life. It really comes down to where Eilis wants to be: in her hometown, where she can have the satisfaction of proving herself to everyone who ignored her for so long, or in a foreign land where every day seems to brings something new and exciting. 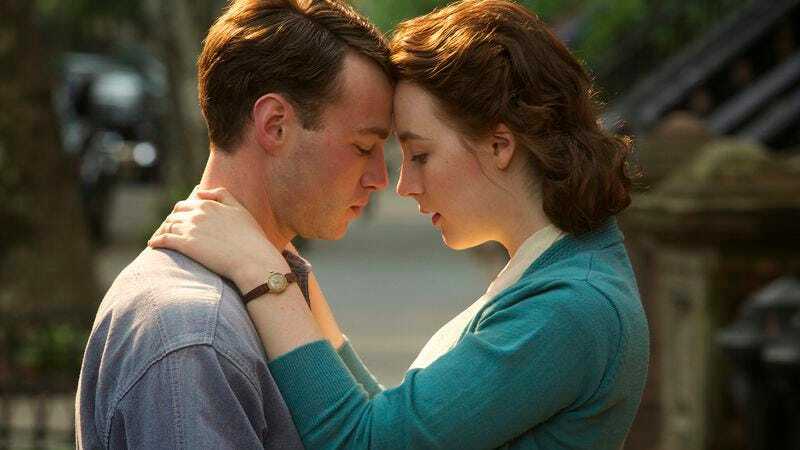 Brooklyn’s based on a 2009 novel by Colm Tóibín, adapted by director John Crowley and screenwriter Nick Hornby—the latter of whom has become a skilled interpreter of other people’s work, judging by this film and last year’s Wild. Crowley (who previously helmed the very good British dramas Intermission and Boy A) and Wild cinematographer Yves Bélanger give Brooklyn a sumptuous look, bringing a soft brightness and pretty pastel colors both to pastoral Ireland and to a sprawling, culturally diverse metropolis. But it’s Hornby who does much of the heavy lifting here, keeping the dialogue spry and witty through an opening hour where not much happens, aside from Eilis being scared and lonely. When the real drama finally does kick in, it’s at times a little contrived and overly melodramatic, trying to force the heroine into action—and into making a decision. But that’s only noticeable because the rest of Brooklyn is so refreshingly low-key. The story doesn’t wind its way toward any big, life-changing revelations, nor does it try to win sympathy for Eilis by surrounding her with cartoon villains. As played by Ronan, Eilis is a heartbreaker anyway, regardless of what she’s going through. She’s a capable young woman who’s been underrated her entire life, and it’s a joy to watch her blossom from scene to scene. Brooklyn could be seen as a sunnier, shallower variation on James Gray’s more harshly realistic (and brilliant) The Immigrant, or even a sweeter version of Tóibin’s more pungent novel—but that unfairly undervalues what Crowley, Hornby, and Ronan are doing. Brooklyn is crowd pleasing, but not pandering or broad. Instead, it’s an optimistic yet down-to-earth depiction of what “the American dream” has really meant to so many millions. Eilis isn’t an entrepreneur, and she’s not looking to strike it rich. She’s someone who for over 20 years has become accustomed to graciously accepting whatever scraps are given to her. Then she comes to New York, and learns that there’s real power in having a choice. It’s both rare and heartening to see a movie that grasps the poignancy of everyday life decisions: where to live, what job to take, who to partner with, and how to press forward when every forking road promises something gained and something forever lost.